Easily one of the better Gundam games to ever make it West, Gundam Versus is an incredibly rewarding arena-based mech-'em-up. A wide selection of gameplay modes ensure that there's always something to hold your attention, while the tense action itself offers depth, variety, and satisfaction. Gundam Versus has really cut into my fighting game time. It appeals to me for many of the same reasons that more conventional fighting games do: a laser-sharp focus, the layered and complex mechanics, the mind games and the sheer speed and intensity of the battle. That it involves giant battling robots is just the cherry on top. 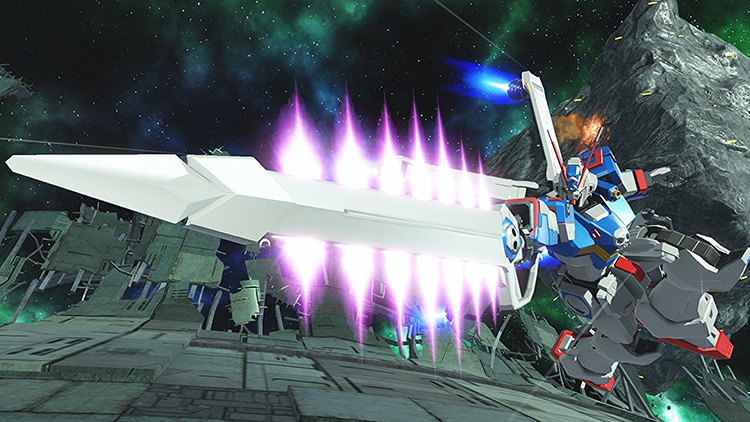 Much more than a licensed game functioning as a box of fan service for existing Gundam cultists, Gundam Versus is a fresh, well-crafted fighting game that’s worth your attention whether you care about Gundam, the fighting genre or both. 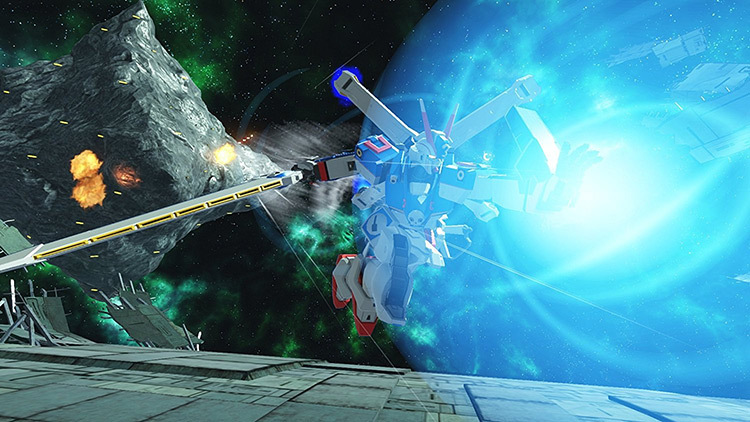 Gundam Versus – if you are a fan of the series – is a winning package. The gameplay is great, the graphics are a nice blend of anime and realism, with a soundtrack that sounds like a Saturday morning cartoon for an action anime that is oddly fitting, and it’s still a great feeling to win a match, however, it just doesn’t have enough for the average player to get hooked. 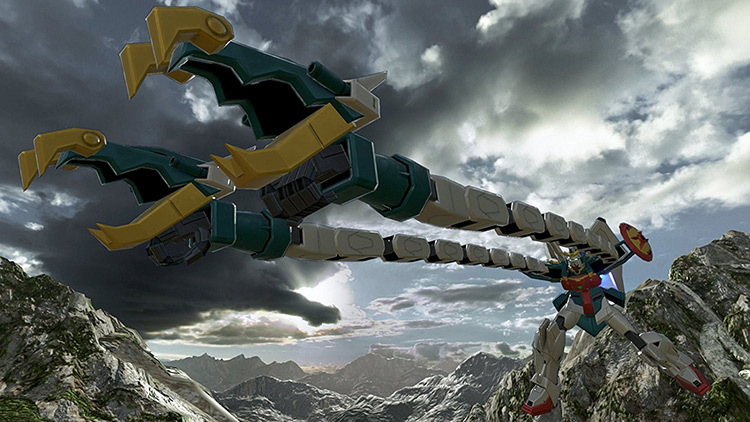 All in all, Gundam Versus is a good game that reminds fans why giant robots are cool. If you're a fan of the Gundam series, you should feel right at home here -- though I would highly recommend that newcomers opt to play the tutorial. With so many suits to choose from and some messy UI design, some gamers might not enjoy it quite as much. 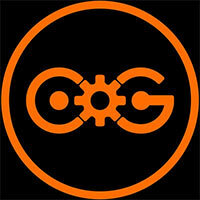 But if you can look past those issues, this game is a truly enjoyable mech-fighting experience. Gundam Versus is a fun game. If you love the Gundam series you will find something about this to like I’m sure. 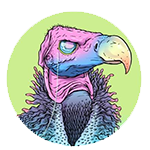 There is a possibility of gameplay getting stale after a while because it’s a lather rinse experience of playing, get exp, then unlock something. 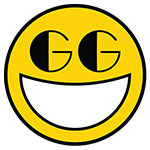 Overall though the game modes are fun and facing skilled players is fun. This is me speaking as a fan of the shows, who would get home from school as a kid and go straight to watching Toonami if you are a fan of the show and this style of gameplay is up your alley I think you will have a good time. All things considered, Gundam Versus makes a solid first impression to the series. Coupled with the wonderful variety of playable characters, the 2v2 gameplay is a unique experience every round, and I can’t wait to struggle through the Ranked matches. Gundam Versus is dedicated to the Gundam universe, and the treatment of the source material is easy to appreciate, even for someone unfamiliar with the series. That said, some loose mechanics, the paltry localization, and multiplayer's inability to deal with less-than-perfect network connections aren't easy to ignore. A smarter locking system, better demonstration of the differences between various Mobile Suits and the ability to attack downed enemies like they can to you would make for an improved experience, on the battlefield at least. 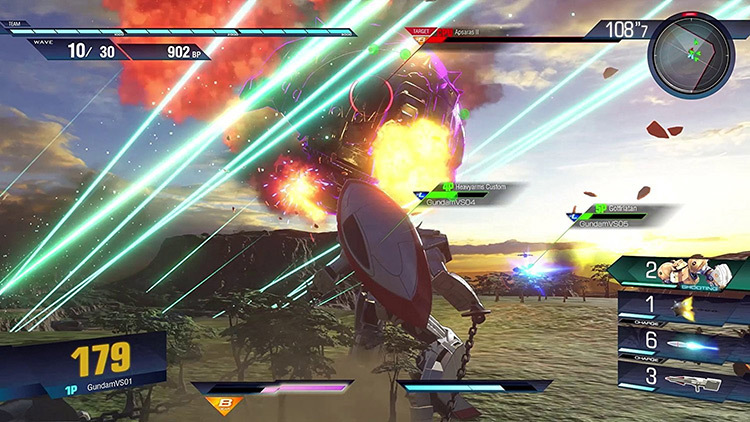 But Gundam Versus nonetheless offers some light-hearted, robot smashing fun. What will keep players coming back to Gundam Versus is the huge amount of unlockable content. From different Striker abilities to different pilots and player emblems, there are a ton of things to spend Gundam Points on. While earning them, players will also be leveling up individual Gundams. As someone that likes to see numbers go up and watch things on a checklist get crossed off, Gundam Versus appealed to me from a completionist standpoint. Playing Gundam Versus is its own reward. While it may not be a great introduction to the series for those who read the names of mobile suits as gibberish, anyone with a fondness or curiosity for one of the most enduring sci-fi franchises of all time has more than enough toys to play with for a long time. The combat is a great blend of reverent, fast-paced, and precise, and while solo players may be disappointed in how unsatisfying the single-player is, those who’ve spent years building their own stories with action figures will find a lot to love. Beyond the impressive visuals and large collection of different Gundam units featured in the game there is not much else going for this title. 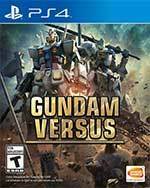 Gundam Versus is an interesting title that will tick all the boxes for any fan of the series but sadly does not feel like a complete package that is lacking in reliability and content. I’m happy to finally have an official English release of Gundam Versus in my hands, but confused as to why it feels less feature rich than the last game. There’s the amazing framework and attention to detail that makes this such a fun game to play, but there’s just very little for you to sit down and actually put those gameplay systems to use in. Having a group of friends to duke it out with will add a lot more value to the experience, but without that, you’re looking at a delicious burger that’s missing a bun and maybe just has a little piece of lettuce on it. It's at this point we realised the tutorial really taught us nothing, as each Mobile Suit has its own weapon systems and abilities. With no way of checking in the menu beforehand, the only way to discover what you are dealing with is to jump straight in, and with over 90 suits to play with, that's a lot of trial and error. It’s a refreshing change to see a fighting game that utilises the 3D arena to the fullest. Having a plethora of customisable Gundams makes the battles refreshing, new, and fun every time. Unfortunately, the game feels too robotic and stiff compared to most fighting games where they feel fluid, and it’s certainly not newbie friendly. Adding a messy inconsistent graphical interface makes for an unpleasant experience. Any Gundam fan is sure to have a blast as they explore the roster and see the love that has gone into animating each mobile suit with its most famous attacks and weapons. 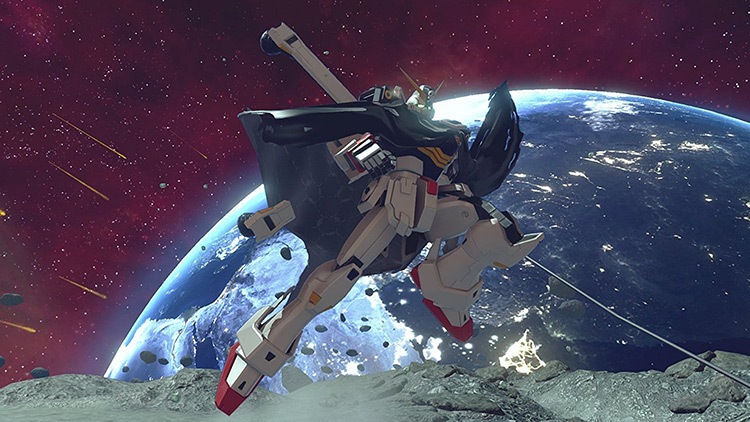 Players who aren’t fans of the franchise already can still have a lot of fun if they love a competitive multiplayer experience, and they may even get hooked on learning where some of their favourite mobile suits come from. 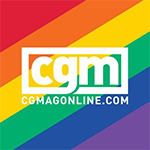 Aussi vide qu'une rédaction de jeu vidéo en plein mois de juillet, Gundam Versus se met illico hors-jeu dans une optique de découverte ou d'initiation à l'univers Gundam. Faute de modes de jeu suffisants pour satisfaire l'appétit des joueurs solitaires, et en l'absence de multijoueur stable et fonctionnel, ce premier jet sur PS4 ne pourra séduire que les fans invétérés des innombrables séries. Gundam Versus riesce a imporsi anche come un picchiaduro/shooter a squadre molto divertente soprattutto quando si gioca online. 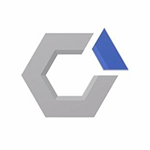 Purtroppo al momento il servizio è davvero scadente e mette a repentaglio il futuro di un franchise che potrebbe avere grandi potenzialità, specialmente se Bandai Namco dovesse proporre, in futuro, un roster più interessante e una serie più nutrita di modalità single player. Per adesso ci sentiamo di consigliarlo soltanto ai fan più sfegatati di Gundam. Gundam Versus è un titolo che richiede dedizione: il tutorial va affrontato anche più di una volta se è necessario, e gli scontri vanno visti in chiave frenetica piuttosto che tattica, anche se non mancano super mosse deputate all'aiuto del proprio compagno e altre azioni da pesare con una certa strategia.